Resin Snowbearie Blue Ornament; 4" White resin snowbearie ornament with a blue ribbon that can be personalized. We can personalize it with any sayings, It's a boy, the child's name & date, etc. 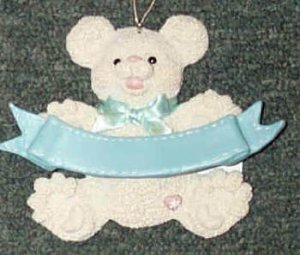 This..
Resin Snowbearie Blue Ornament; 4" White resin snowbearie ornament with a blue ribbon that can be personalized. We can personalize it with any sayings, It's a boy, the child's name & date, etc. This is great for a gift for a baby shower or for a newborn.